Literally translated, ‘‘Amahoro’’ means Peace. It’s not only the name of our company, but also our motto. 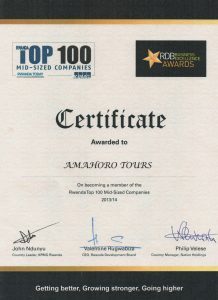 Our fundamental objective here, at Amahoro Tours, is to promote local tourism that is both responsible and sustainable. We do it with a view to not only contribute to the economic development of the region and the prosperity of all those involved, but also to raise awareness and help visitors to Central Africa and the surrounding regions understand our way of life. Come join us on one of many African tours and enrich your experience with exciting cultural activities in the lush and unspoiled scenic heart of the African continent. Through the years, we have established ourselves as leaders in eco-tourism and community-based tourism in Rwanda. Our customizable tours are designed to provide you with as much interaction with the locals and like-minded visitors as possible, while also enabling you to enjoy nature at its finest. We cooperate with an extensive network of community organizations, international NGOs, and volunteers from the four corners of the world. Prompt, efficient, engaging, and safe — these are the qualities that set Amahoro Tours apart. Rely on us to turn your sojourn, however brief, into a journey of exploration. 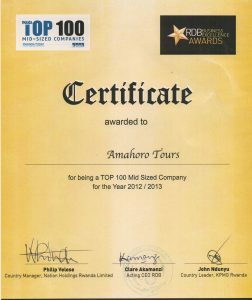 Our work encompasses the efforts of the Amahoro Tourism Association. It’s a network of local communities, co-operatives, and individuals, who would like to participate in tourism activities, but often lack the knowledge or means to do so. We believe tourism plays a major role in this initiative as a tool for sustainable development, the alleviation of poverty, and the promotion of peace. Most of the activities offered by Amahoro Tours focus on visits to our many partners, such as traditional healers, brick makers, and banana bark weavers. They offer an unforgettable experience that is unique to every visitor. Where possible, visitors can even enjoy hands-on activities and games by participating in cultural activities. We offer Rwanda tours, Congo tours, and Uganda tours, all of which offer a unique and memorable experience. We have regular talks with the leaders of each group or association to see how we could best contribute, ensuring their continued growth. In many cases, we make a financial contribution to a community account, knowing that even the weakest member of the group, together with his or her family, will benefit directly from such an arrangement. This little additional income often opens up the opportunity to send another child to school or to buy equipment that significantly raises the productivity of the group. Other groups may receive assistance in the form of professional advertising and direct marketing for their activities. We also actively encourage each local to suggest their preferred type of benefit. Thus, we make sure that the maximum number of locals can take advantage of the opportunities available to them. Through our activities, we support the conservation of the natural environment and the preservation of cultural assets. Furthermore, by sharing our revenue and other economic benefits with the locals, we help nurture their sense of pride and their awareness that someone cares. In so doing, our objective is to contribute to the sustainable development of local populations. Join hands with Amahoro Tours, and help us make a difference! 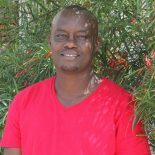 Over the past years, Greg has gained experience working as a Rwandan tour organiser and guide for various international tour operators. His professionalism and reliability, along with his exceptional understanding of the needs and desires of international visitors, have gained him renown among clients and respect among the members of local communities. He is the co-founder and president of the Ruhengeri Community Eco-Tourism Association, a local association of people collaborating to enhance tourism development in Rwanda. Greg relies on a network of contacts in the area, all of whom are happy to take part in this project. With his experience, know-how, and contacts, Greg will make your bespoke visitor experience memorable, while also benefiting the locals as much as possible. Greg works with an experienced and highly motivated local staff team responsible for client contacts, as well as tour development and facilitation. James Cave has built a solid reputation as teacher and coach in Minnesota, United States of America, for more than 20 years. During this time, he has managed to develop viable educational travel programs for high school students together with private groups to Washington, DC, the Civil Rights South, the Civil War East, and in Guatemala, Ghana, Thailand, and most recently Rwanda. James first came to Rwanda in 2005 to study the culture of the people and gain a deeper insight of the 1994 genocide against the Tutsi for the high school social curriculum he was developing at that time. His coming to Rwanda opened his eyes to how the people of Rwanda have moved on from the traumatic days of the genocide, and over two decades later, have through sheer resilience managed to build a post-genocide country now known for its development, peace, and serenity. Due to his many years of experience touring the country, and learning about their history and way of life, James has been a strong voice speaking around the United States on varied topics about the genocide in Rwanda, social justice, and restorative justice. Doctor Kim Hammond is a licensed veterinarian and our primary Gorilla and Primate Tour adviser.